This Dachshund wine bottle holder measures 6" tall, 11" long and 5" deep approximately. This Dachshund wine bottle holder is made of polyresin, hand painted and polished individually. Color Tone may vary from pictures. It makes a great centerpiece for your wine cellar or your dining table!!! Give it away as a gift to a loved one too!!! This adorable Dachshund resembles your very own pet! Famously nicknamed the sausage dog, he is a very stubborn hunting dog and he has a knack to chase small animals around. He is featured in this showcase in the black and tan short hair coat breed. This Dachshund wine bottle holder measures 6" tall, 11" long and 5" deep approximately. 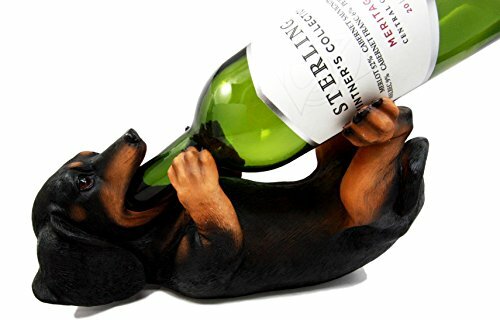 This Dachshund wine bottle holder is made of polyresin, hand painted and polished individually. Color Tone may vary from pictures. This adorable Dachshund resembles your very own pet! Famously nicknamed the sausage dog, he is a very stubborn hunting dog and he has a knack to chase small animals around. He is featured in this showcase in the black and tan short hair coat breed.